Evasi0n jailbreak is undoubtedly the most popular untethered jailbreak of all time. Supporting a range of iOS devices, Evasi0n gave us the freedom we wanted to modify our iPhone, iPad or iPod Touch with free and easy access to heaps of Cydia tweaks and apps – it took time to get to us but it was well worth the wait. Evasi0n Mac (ver. 1.0.8) link above. Before you jailbreak your device, ensure that you have updated iTunes to the latest version and back your data up using iTunes, iCloud or both. 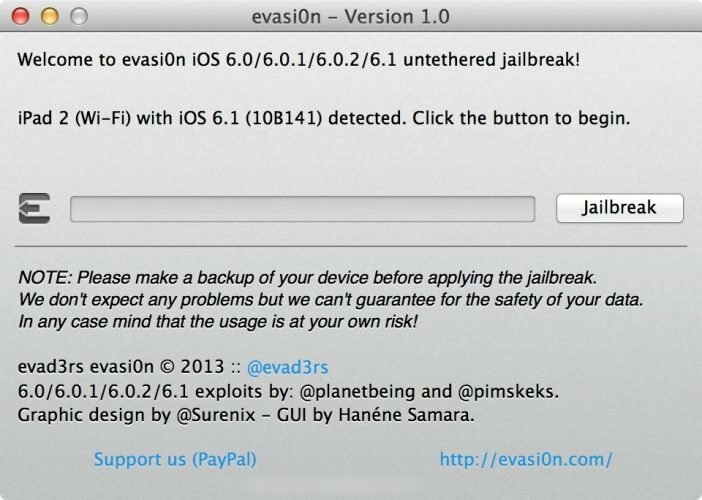 Download Evasi0n jailbreak onto your computer using the link above and save it to the desktop. You will see a message that tells you the jailbreak is complete; expect a few restarts on your device throughout. When your device has rebooted for the last time, you will see the Cydia icon on your home screen, and you can start using it. Please be patient; the entire process can take a while and must not be interrupted. If it does stop working (the screen has frozen, or it is stuck on one part for several minutes) you can do a hard reset on your device and start again. If your jailbreak process appears to be frozen on “Patching Kernel”, be patient; some users have reported that part of the process taking around 18 minutes to complete. If it takes a lot longer than this, hard reset your device by pressing the power and home buttons together until it reboots. This is also a part of the jailbreak that may take a while to complete, up to 10 minutes in some cases. As above, if it takes a much longer time, hard reset the device and start again. Some users have reported problems with not being able to log into their Cydia account or the “My Accounts” page not being visible. This is down to the jailbreak team repository owners to solve so you will need to be patient. In some cases, setting your DNS to the 8.8.8.8 Google servers may solve the problem. Some users report seeing this even when they have connected their device. Before you start, go into iTunes and disable the password protection on your iTunes backups – you can enable it again after the jailbreak. This affects the iPad – a second Weather app may show up after the installation. This is nothing to worry about; the app is there as it should be and may be hidden inside a configuration file. Other users have reported that their Weather app crashes after installing Evasi0n. Check Cydia for updates in the first instance and apply any that are available. Other than that, we will need to wait for a fix, and that will be made available on this page as and when we have it. This is an irritating issue to some users, and there are a couple of ways to fix it. Find full details about how to fix an endless reboot loop. If you do install Evasi0n, don’t use any apps that have not been updated with the relevant firmware support. This should fix the above problem and let you use the jailbreak easily. Do not use the OTA method when you update your firmware as it is not compatible with Evasi0n jailbreak. Always update using iTunes instead. Always back your device up and restore it using iTunes before you attempt the jailbreak. Wait for your device to be restored and then try Evasi0n jailbreak again. This page will be kept updated as needed, and you can get the latest updates by liking the page on Facebook, clicking Following > See First so that published updates will show on your newsfeed.